Welcome to Inner Artistry, a way to explore the wholeness of you. Making space for the inner conflicts, the chaos, the big feelings. And celebrating you for who you are, your desires and inspirations, your creations and performances. Inner Artistry is a place to take care of you. Being an artist, a performer, an entrepreneur, a human, can be challenging in this world and culture. There might be a set of external challenges you experience, like irregular income, rejections, weird work hours. And inner challenges, like performance anxiety, burnout, feeling like you don't fit in, unhappiness. Inner Artistry is an invitation to explore any circumstances with warmth and compassion, using the Internal Family Systems (IFS) model. An invitation to turn inward, because in going inward, new connections are made, new freedom is found, new resilience is opened. 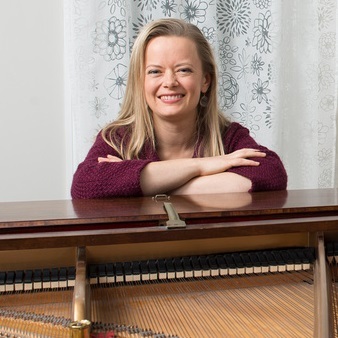 Hi, I'm Marta Johnson, IFS practitioner, pianist, performance and creativity coach, and I help people uncover their natural Inner Artistry. Your Inner Artist is that part of you who already is confident, creative, compassionate, resilient. I work with creatives, performers, curious explorers, entrepreneurs, and parents. I believe all people are creative and curious at heart, and IFS is one way to explore into any area that you are called to explore. I invite you to sign up for my newsletter to see if this work resonates with you. Signing up also gives you access to two videos on Dealing with Fear, occasional newsletters, as well as listings of all upcoming classes. If you’d like to read more about who benefits from this work, click here. If you'd like to read more about the process, please click here. Contact me anytime at Marta@InnerArtistry.space or 773-793-0864. I welcome connection with you via email, video chat, phone, and in person.